Perma-Loc Tubing End Caps are used to close the ends of your runs of poly tubing. The Perma-Loc connectors on these fitting are compatible with Drip Depot polyethylene tubing of the same size. 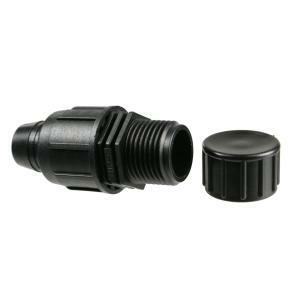 The threads and cap on these fittings are standard garden hose threads and are compatible with most outdoor water spigots and common garden hoses. Hose thread fittings are not compatible with pipe threads (PVC or iron).